20 years of strong economic growth have helped bring India, a country historically divided across many lines, together. With an urban middle class of over 250 million, India is predicted to be the world’s third-largest economy and largest middle-class consumer market by 2030, with a strong demand for European products. In 2006, trade between India and Ireland stood at €700 million; in 2012, it reached €2.3 billion. More than 130 Enterprise Ireland client companies are currently exporting to India. 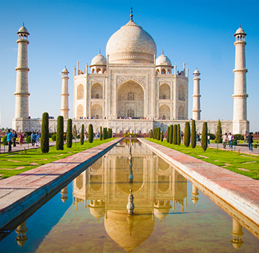 For more detailed information when trading with India, download our India Fact Sheet. For an estimate of landed costs (duties, taxes and other import fees) for shipments going to India use the free and interactive DHL Express Trade Automation Services (TAS) tool, tas.dhl.com. TAS also provides information on regulations compliance and trade documentation. All goods shipments to India require Know Your Customer (KYC) documentation to be presented to Customs; otherwise shipments will go into Customs Bond until the documentation is presented. KYC is recognised by the Indian government as a form of identification. Go to www.dhlindia-kyc.com to upload your KYC (includes listing of suitable KYC copy document types). The shipper needs to be registered with India’s Directorate General of Foreign Trade (DGFT) and provide an IEC (Importer Exporter Code), a unique 10-digit number issued by the DGFT. A GATT Declaration is required for shipments valued above INR 100,000. Evidence of value must accompany the document. A Letter of Authority is required so that DHL can act on the receiver’s behalf. DHL can keep this on file for future imports. Duty exemptions may apply by virtue of specific circulars/notifications by Indian Customs. The receiver needs a valid Import Export Code (IEC) number unless the items are shipped for genuine personal use. An NOC (No Objection Certification) is required for certain imports. If shipper and receiver are the same or related (other than for unaccompanied baggage), additional declarations and/or paperwork will be required or the shipment will not be cleared. Return to Origin (RTO) will not take place. Subject to Central Board of Film Certification (Censor Board’s approval). Subject to destination controls and import licence requirements. Receiver needs to provide necessary paperwork. To be shipped only if the receiver holds a special import permission or licence from the Government of India. Declare correct market value. Subject to government controls. Confirm contents very clearly in the invoice; do not give vague descriptions. Please contact DHL Customer Services before shipping. May require Ministry of Environment and Forests approval. Receiver to provide paperwork for duty exemption. Licence to import, Phytosanitary Certificate and NOC from the Plant Quarantine Department required for clearance. Goods for human/animal consumption: receiver to provide NOC from the Food Safety and Standards Authority of India (FSSAI). Acceptable only if cards are not activated. Declare if drugs are ‘Life Saving’ on the invoice and waybill. Must be accompanied with a copy of prescription or receiver must provide a copy of the prescription. Provide NOC from Assistant Drug Controller (ADC). Invoice needs to include manufacturer’s name, batch number and expiry details. Special clearance charges and duties may apply. Receiver may have to contact the Drug Controller Office. Send in a diplomatic pouch or clearly mark as ‘DIPLOMATIC MATERIAL / MAIL’. Diplomatic mail: can travel as documents. Diplomatic material: should travel as goods; can be cleared duty free only if the consulate or diplomatic mission provides duty exemption documents and applicable paperwork. Requires NOC from the Textile Committee Office prior to clearance. Provide laboratory test reports from internationally accredited testing agencies (e.g. SGS, Lloyds Register, Bureau Veritas) to help reduce delays and warehouse charges. Formal clearance required; receiver to provide requisite paperwork. Receiver needs to provide NOC from the Food Safety and Standards Authority of India (FSSAI). Items can be sent for testing. Confirm in the invoice that the items are gifts or samples. Standard duties apply. Subject to Central Board of Film Certification (Censor Board's approval). Require MSDS/Certification of Analysis (COA) in English. Receiver to provide necessary paperwork for clearance. Declare correct value. Only to be shipped by or consigned to an Embassy, Consulate or other regulatory body; need to be accompanied by an original letter from the Embassy or Consulate. India Customs will decide on authenticity on a case-by-case basis. The receiver must be an individual (e.g. not a hotel or exhibition centre). Unaccompanied baggage shipments will be sent as baggage cargo. Shipper and receiver’s name needs to be the same. Only used personal articles will be cleared duty free. The shipper/receiver needs to be present and provide their passport for clearance. Clearance charges of INR 1,500 will apply in addition to duties, warehousing and local taxes. Personal effects that are not unaccompanied baggage: shipper and receiver name cannot be the same. Items not in original packaging or otherwise used will be subject to import restrictions. Must be postcard-sized and business-related only. Maximum quantity: 10 pieces. May require an NOC from the regulatory body in India. If radio frequency signals and range exceed 4800 MHZ: receiver to provide Wireless Planning Commission (WPC). Subject to import restrictions; ship only if the receiver provides written confirmation to clear shipment and compliant paperwork. For animal products including skins and leather goods, non-prescription drugs / pharmaceutical intermediaries and raw materials for cosmetics, seeds and other plant materials imported for propagation, shipments entering Bangalore packed with solid wooden packing material, temperature-controlled or Worldwide Medical Express (WMX) shipments and x-ray machines please contact DHL Customer Services before shipping.